Arrowhead Alpines Blog: Sciency Answers: What do bulbs know, and how do they know it? Sciency Answers: What do bulbs know, and how do they know it? I hope you don't mind 2 questions in one month ! So I'm looking at all my demo beds today, September 30th, and i'm noticing all the Spring blooming bulbs have awoken and are actively growing . Now how do they know to do this ? How do they know that its almost Fall? They are buried and can't "see" the day length, Its not a temperature drop signaling Fall (in fact it went to 100F here this week ) and they get watered every day, so its not a Fall rains-after-a-dry-Summer-thing. i am in wonder of it all ! Can you explain this mysterious bulb-psychic behavior ? Let's start this answer by remembering the last time you got on a plane and flew across a few time zones. The first few days after you arrive, you get to experience the joys of jet lag, walking around with your body saying "It is night time! Time to go to sleep!" while the bright sun in the sky is clearly saying "It is day time! Time to be up and about!" After a few days you adjust to the local time and everything is fine. Until, of course, you head back home and get to go through it all again. Jet lag demonstrates how we humans tell what time it is: We use a combination of external signals (is it light, or dark?) and an internal clock, our circadian cycle. We get jet lagged when the two ways of telling time don't line up. In response to the confusion, our internal clock gradually adjust until the two are in sync again. Plants are just the same -- they use external signals, the sun, and an internal clock, circadian rhythms, to tell when time it is. Take the signals from the sun away by putting them in a box, and they'll keep up their daily cycle for a while: Daylilies will still last a day, morning glories still open in the morning, and four-o'clocks will still bloom around 4 pm. Plant's internal clock is very well established scientifically, and researchers have even started figuring out how exactly that clock works at the level of genes and proteins (which is cool, but also gets incredibly confusing pretty quickly... at least to me). But Annie's question relates to something else: Do plants have an internal calendar as well as a clock? This is a really interesting question. Sadly, science doesn't have a very good answer for it, meaning that from here on out this is going to be more of an "educated guess answer" than a "sciency answer" because I haven't been able to find any good research on the subject. The lack of research is probably due to the fact you would have to be working on the scale of years not days and it is hard to convince people to spend years on something that might not even work. Even so, I think the evidence is very strong that at least some plants have some kind of internal calendar to go along with their circadian clock. After all, as Annie says in her question, bulbs sprout without any external environmental signals. 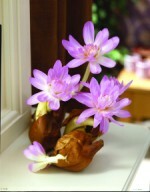 Colchicum for example, flower in the fall, and they will do so even if you forget to plant them and leave them in your (climate controlled, artificially lit) house on a table. The horticulture industry even uses the effect, importing jet lagged amaryllis (hippeastrum spp.) bulbs grown in South Africa (link) to get bulbs that will flower in time for Christmas here in the Northern hemisphere. In his book, Cape Bulbs, Richard L. Doutt, advises collectors of South African bulbs in the Northern hemisphere to import seeds rather than plants, because the jet lagged plants have trouble adapting to our inverted seasons. Gardeners know and deal with bulbs that know what time of year it is, even if science hasn't looked into the matter yet. In my personal experience, the effect isn't just limited to bulbs. Last year, I got some (normally) autumn flowering sedum ('Matrona', I think) from a friend. She was doing research on their flowering, and tricked them (with artifical lighting) to bloom in the spring. Once they flowered, she didn't need the plants anymore, so I took some home and planted them, in full flower, in the spring. All that summer they never really grew, just limping along fitfully. I think they were jet lagged, expecting winter to come after they finished flowering and instead getting a big dose of summer. Eventually, of course, winter did arrive, which apparently reset their internal calendar, allowing them to grow and flower normally this year. An internal calendar isn't the only possible explanation -- maybe they just had an extreme case of transplant shock -- but I think it is likely. Putting all this together, I think it is clear that many bulbs, and perhaps other plants, have some kind of internal calendar keeping track of what time of year it is. But given the lack of research on the subject, I can't say much authoritative or "sciency" on the subject... Any plant physiologists out there looking for a PhD project? This would be an awesome one! It will probably take you a decade to get useful data, but think how cool it will be when you finished! Have a question? Send me an e-mail (engeizuki at gmail dot com) and I'll provide a sciency answer! Wow...plants continue to amaze me...great post! I wonder if Annie's annuals work the same way? Like, after X number of hot days above X degrees, they know that fall is right around the corner and it's safe to start coming out of the ground? No, typical phenology/degree days counting doesn't work here -- because these bulbs start growing in the fall no matter if you grow them somewhere hot or somewhere cold. If it was just that, Annie's plants would be growing WAY earlier than mine -- but instead, everybody waits until fall, and then gets going.